KidzMin meets every Sunday from 9-10 a.m. at St. Michael's school, with the exception of Thanksgiving, Christmas, New Year's, Easter, Mother's Day and Memorial Day. We also do not meet when school is out in June, July or August. Your children are welcome to join us anytime! Mrs. Hecht was born and raised outside of Buffalo, NY. Raised Catholic and educated at a Parochial High School, it was after she married her husband Jacob and upon the birth of their first daughter that she started Lutheran membership classes. Kristin is also a member of our Praise and Worship Team Choir due to her love of God and praising Him through song. Mrs. Hecht also enjoys being involved with the church whenever she can. She and her husband have 3 children. Mrs. Love co-leads Pre-K/K with Kristin Hecht is married and has 2 young children where they lived in Vassar. Heather joined the KidzMin family in 2017 when her youngest started attending. Her oldest was a KidzMin student for a couple years with an impeccable attendance. Heather is very excited to share the Word of God with some of our younger congregation members. Mrs. Hoeppner is a graduate of Valley Lutheran High School. She has a degree in elementary education and is the St. Michael's Media Center Director. Mrs. Hoeppner will also be co-coordinating VBS this year! She is married to Aaron and they have 2 children currently enrolled at St. Michael's. 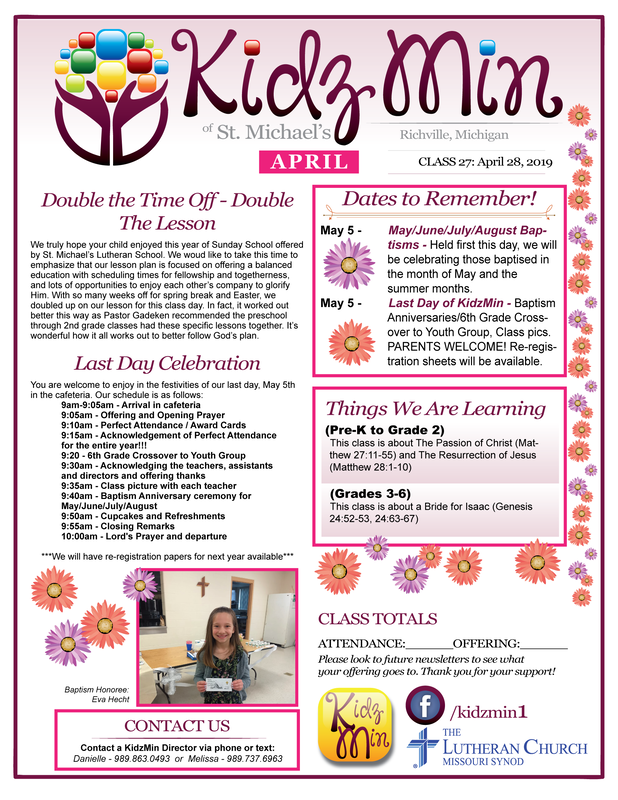 KidzMin is back in session! or at our Welcome table on Sunday morning at the school lobby. Check back with us weekly for updates to our newsletter, which you can download by clicking on the link below. Mrs. Reinbold co-leads 1st and 2nd grade with Mrs. Buchinger and Mr. Courville. A lifelong Lutheran and Christian, Mrs. Reinbold holds a teaching degree in English and Theatre/Speech, and enjoys singing with her God-given musical talents. Mr. Courville co-leads 1st and 2nd grade with Mrs. Buchinger and Mrs Reinbold. Mr. Courville started Lutheran membership classes in 2008. He and his wife have 2 children that are active in KidzMin as a student and as a teacher's assistant. Your Heart's Desire by Sheri Rose Shepherd. 14 Truths that will forever change the way you love and are loved. This book is written for the married, single or divorced worman. It is filled with hope, humor and healing. The author has been in women's ministry for 20 years.